← Voted Best in the Nation! 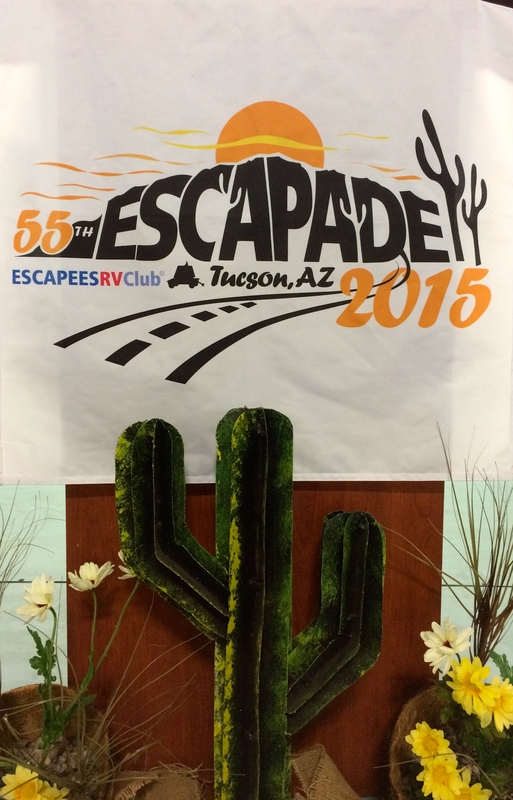 We have spent the last week at the Escapees Escapade in Tucson. Although, we enjoyed our experience at the Good Sam Rally a couple weeks ago, we prefer this one in so many ways. 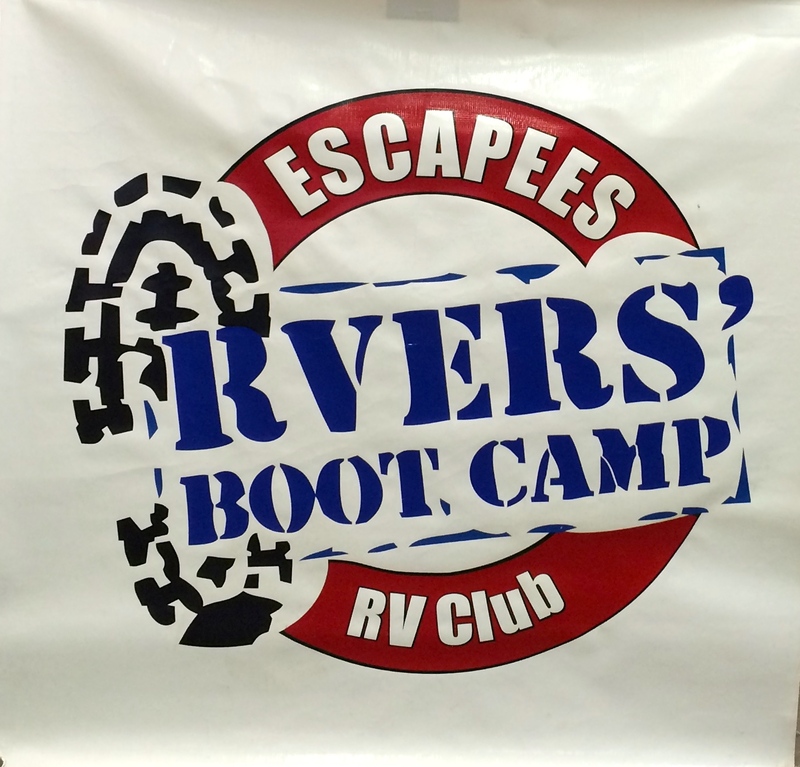 Escapees is an RV Club that supports the RV lifestyle. In addition to the national Escapade, it has a mail service, monthly magazine, and RV parks. 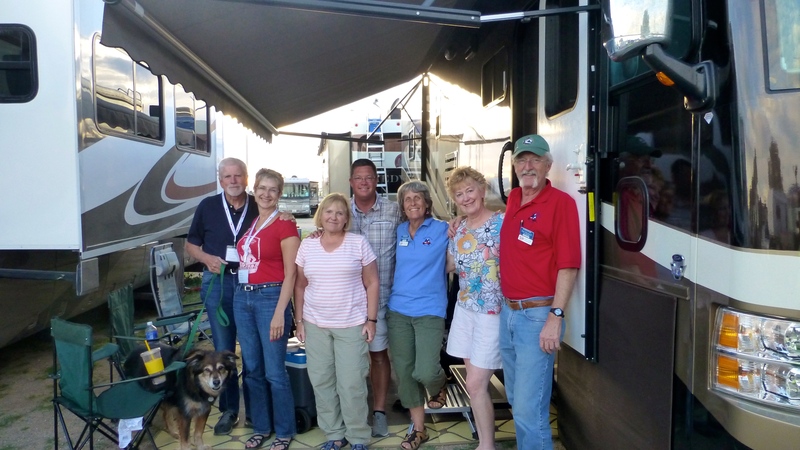 The club monitors and impacts legislation effecting full time RVers and sponsors CARE, an RV community where people needing assistance can live in their RV while recovering, or aging. 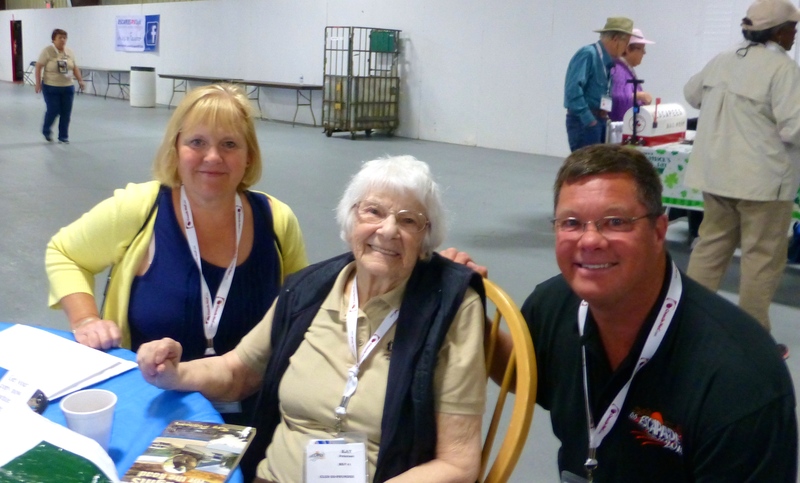 We were able to meet one of the founders, Kay Peterson, now 88. The week started with Boot Camp, which is RV101 and so much more. Even though we have owned an RV for 11 years, we still learned a lot. 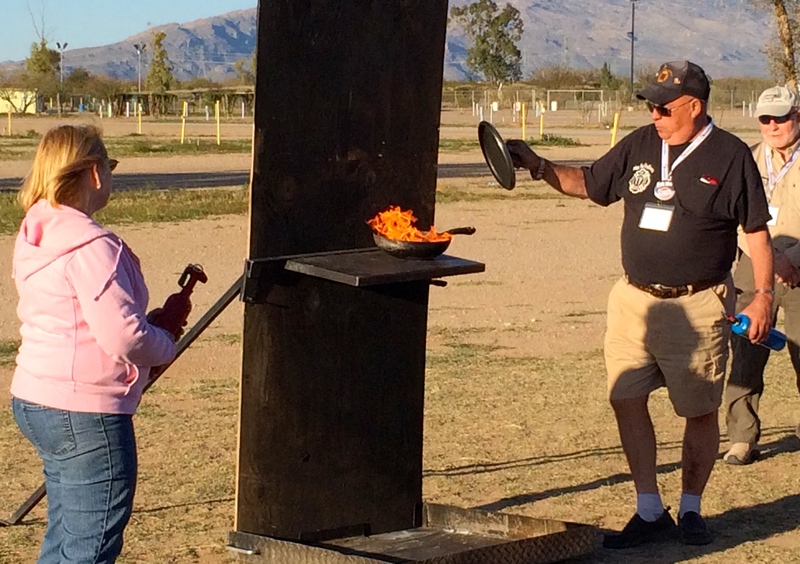 There were 3 days of classroom instruction and demonstrations. One day I assisted Mac the Fire Guy with a demonstration – although it was a set up because my fire extinguisher didn’t work. We have already made several modifications based on things we learned in the classes. We also learned about the importance of weight and distribution on the axles. We had our truck and trailer “Smart Weighed” and found that we are in good shape regarding axles and right up at the limit for both truck weight and truck pulling weight. We’ll be shedding a few more things just to be safe. We learned that there are 1.5 million people out here living full time in their RVs including quite a few solo women. They were well represented here at the Boot Camp and Escapade. Escapees is trying to branch out and give support to a growing population of younger full timers who are working and supporting themselves on the road. Escapees is calling them Xcapers. We met Cheri and Chris, one of the couples leading that effort. 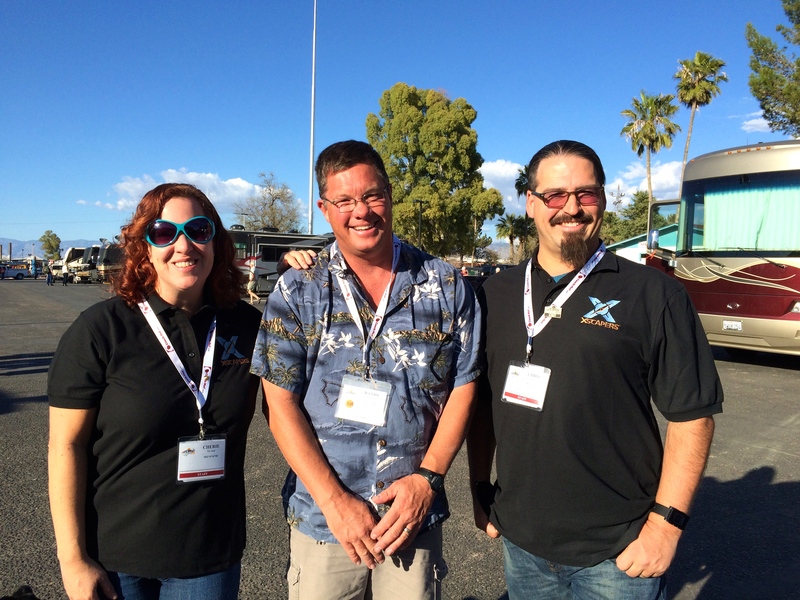 Randy has utilized information from their mobile internet business, Technomadia, so he enjoyed meeting them. Once the regular Escapade began, the place really filled up, and we had seminars, entertainment and activities – including daily line dancing 🙂 There was a vendor tent and an area to get information about some of the varied regional and interest groups under the Escapees umbrella. Escapees are also friendly and social. We enjoyed making new friends and having happy hours and meals with others. We spent time with couples from Oregon, New York, Pennsylvania (not pictured) and a solo from Atlanta. 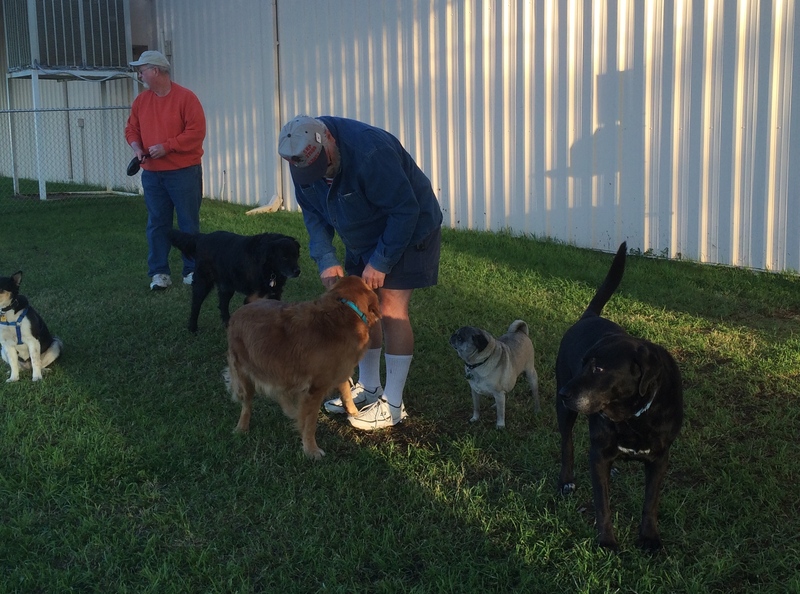 We also had two dogs in our group, Bear and Elko. Elko enjoyed being able to go to Happy Hour! 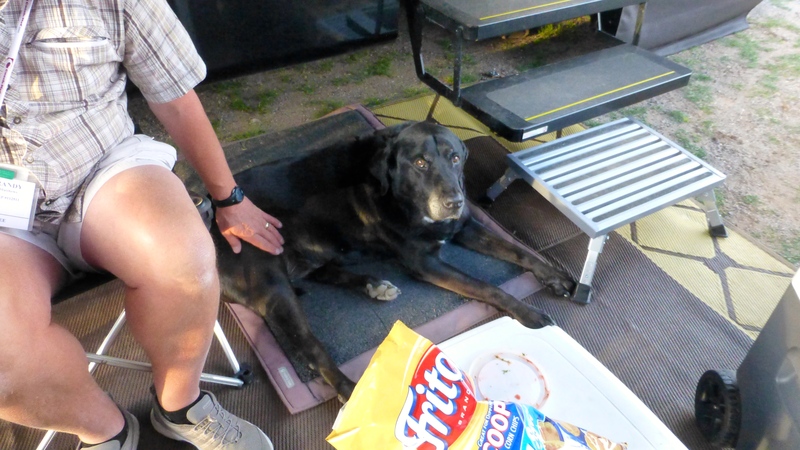 Even Elko was more social this week! He doesn’t usually care about going into dog parks and hanging out with the other dogs. For some reason he loved this dog park and led us there whether it was our intention to take him or not. We are tentatively planning to go to the 2016 Escapade in Vermont. We see the next Escapade as a good prompt to go east and explore another part of the country. Today we headed north of Phoenix to Lake Pleasant Regional Park. We have a desert and lake view! My parents are on their way to Arizona to meet us and take in a few Mariner’s Spring Training games. More on that next time! I am really enjoying your very enjoyable comments and points of interest. I love friendly, positive people. Greet your parents from me. Jon and I are excited about our move to a brand new home on the 27th.of March! Falling in love at age 73 feels magical. We are so happy making each other happy! Looking forward to meeting your Jon this summer. Best wishes for the new love and the new home! keep the great travel log coming. Hi Bev and Glenn. I’ll pass on your your greeting!